YakGear Brand Ambassador Paul Lopes’ fishing addiction began when he was in his early teens. That first catch had him hooked, and he’s continued the sport through the years. 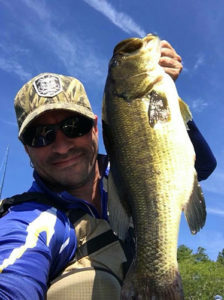 A Massachusetts resident and family man, he said his primary focus is freshwater fishing in his kayak, especially targeting largemouth bass. He plans to expand into saltwater fishing, with hopes of catching his first striper or blue fish. Paul also hopes to enter the tournament scene in the near future. Time on the water equals tranquility for Paul, but he doesn’t always go it alone. He enjoys fishing with his family, which includes his wife, two daughters and two young grandsons. “Nothing beats the excitement of seeing someone else catch a fish,” he said.